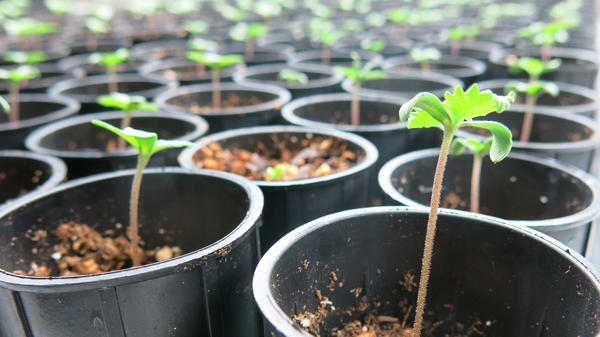 The hemp seedlings in Ben Holmes' warehouse in Lafayette, Colo., will be ready for harvest in about 50 days. Holmes says that during the peak growing season, the little sprouts can shoot up several inches each day. Hemp plants look much like their cousin, marijuana, but lack the THC compound that gives users a high. Hemp fibers are used to make rope, clothing and car interiors. 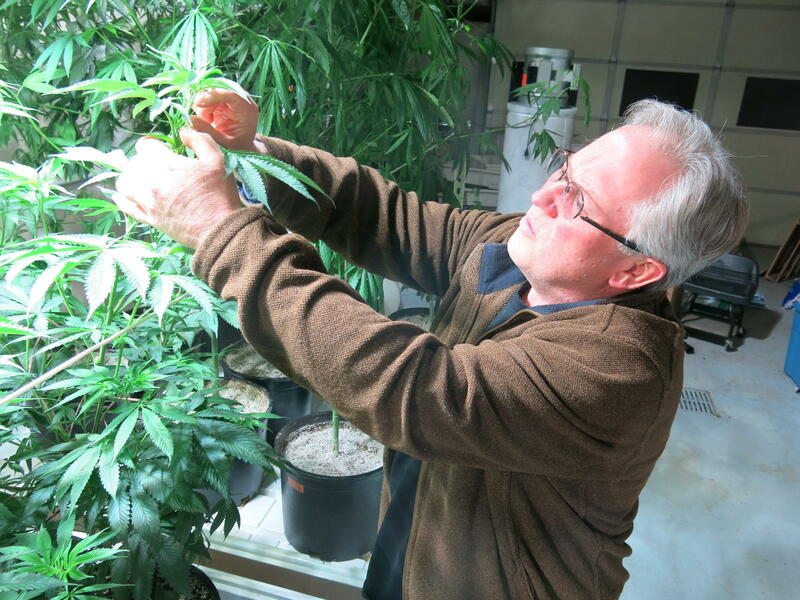 Ben Holmes examines the leaves on his hemp plants. He says the plants get to be 20 feet tall. Jim Denny is one of more than 100 growers given the nod by the Colorado Department of Agriculture to start planting hemp seeds. On his farm in Brighton, Colo., just outside Denver, Denny is prepping for planting season. He recently converted his old vegetable garden into a plot to grow hemp. Hemp is the same species as marijuana, but a different variety — one that lacks THC, the compound that gives users a high when smoked or ingested. Hemp seeds are increasingly showing up in foods, and Denny says the plant's fibers can be turned into everything from clothing to rope to car interiors. "The crop right now is sellable," he says. "I've already had people contact me on my website saying, 'We know you're growing stuff and we want to buy it from you already.' And we haven't even put it in the ground." The recent farm bill allows farmers to start experimenting with hemp in states that have legalized the crop. The plant has been tightly controlled for almost 50 years. During World War II, the U.S. was so hard up for hemp for use in rope on naval ships and on trooper's parachutes that the Department of Agriculture actually made a promotional film to encourage farmers to grow it. The film's title: Hemp for Victory. But that was a long time ago, and today U.S. hemp seed is scarce. It's technically still illegal to import viable seed — it has to be sterile. So anyone with usable seed is suddenly very, very popular. Ben Holmes is one of those people. He's the owner of Centennial Seeds. 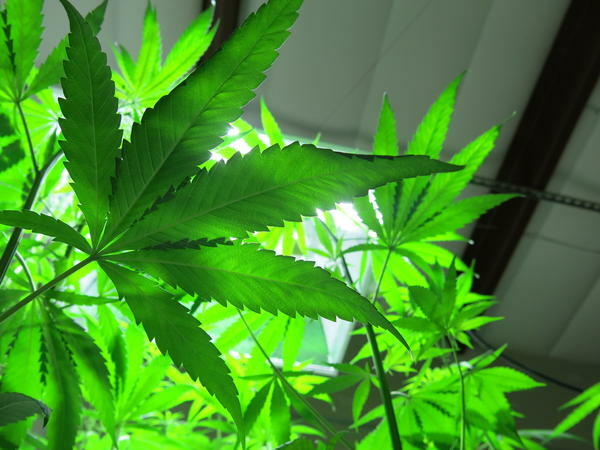 In his warehouse in Lafayette, Colo., emerald-colored hemp plants tower overhead. This year, demand for hemp seed far exceeds the supply, and Holmes says he's been inundated. "I get calls every day of every week of people who want to go into the hemp business," Holmes says. "When I let them know the seed isn't available, they really are sort of lost." As a distributor, Holmes is in a great situation to actually get seed to farmers — except he doesn't have enough to go around. The Drug Enforcement Administration recently seized a shipment of Italian hemp seed to Kentucky. Holmes even admits he had to acquire some of his seed through nefarious means. "It would just show up in the mail or by FedEx, or someone would come to my office and say, 'I'm a friend of so-and-so from [the] Czech Republic and he asked me to give you this,' and little bits of seed would come my way," Holmes says. That level of intrigue is probably enough to scare off most large-scale crop farmers from hemp. The reality is, it's pretty tough to grow hemp in the U.S. right now, with limited seed stocks, legal roadblocks and nonexistent research. Eric Steenstra, executive director of Vote Hemp, a group that lobbies for hemp legalization, is trying to temper expectations that hemp will be a savior crop for struggling Great Plains farmers. At least initially. "There's no question in my mind that this could be a multibillion-dollar crop where we could see millions of acres, eventually," Steenstra says. "Is that going to happen in a year or two? Of course not." But Steenstra says that with the plant's inclusion in the latest farm bill, it may not be too long before some of America's amber waves of grain get a little greener. Marijuana is now legal in Colorado and Washington state, but the status of one of its very close cousins is less certain. Across the country, a handful of farmers are planting hemp - a plant with an incredibly wide range of uses, none of them drug related. The go-ahead to plant hemp was given in the latest federal farm bill. Despite that, farmers say they're still getting mixed messages from the federal government. From member station KUNC in Greeley, CO, Luke Runyon reports. LUKE RUNYON, BYLINE: On a windy morning at his home in Brighton, CO., - a small town just outside Denver - Jim Denny is prepping for planting season. JIM DENNY: And one is out here, in this - used to be a vegetable garden. RUNYON: Denny's one of more than 100 growers - given the nod by the state's Department of Agriculture to start planting. Hemp is the same species of marijuana, but a different variety - one that lacks THC, the compound that gives users a high when smoked or ingested. Hemp seeds are increasingly showing up in foods. And Denny says the plants' fibers can be turned into anything from clothing to rope to car interiors. DENNY: The crop right now is sellable. I've already had people contact me on my website saying, we know you're growing stuff and we want to buy from you already, and we haven't even put it in the ground. UNIDENTIFIED SPEAKER 1: This is hemp seed. Be careful how you use it. UNIDENTIFIED SPEAKER 1: Hemp for Victory. RUNYON: But that was a long time ago. And today, U.S. hemp seed is scarce. It's technically still illegal to import viable seed, it has to be sterile. So anyone with usable seed is suddenly very, very popular. RUNYON: Ben Holmes is one of those people. He's owner of Centennial Seeds. In his warehouse in Lafayette, CO., emerald-colored hemp plants tower overhead. HOLMES: So these would be 20 feet tall. RUNYON: This year, where demand for hempseed far exceeds the supply, Holmes says he's been inundated. HOLMES: And I get calls every day of every week of people who want to go into the hemp business. And I let them know that the seed isn't available, that they really are sort of lost. RUNYON: Even though Holmes is in a great situation to actually get seed to farmers being a distributor, he doesn't have enough to go around. Holmes even admits he had to acquire some of his seed through nefarious means. HOLMES: It would just show up in the mail or by FedEx, or someone would come to my office and say, I'm a friend of so-and-so from Czech Republic and he asked me to give you this, and little bits of seed would come my way. RUNYON: That level of intrigue is probably enough to scare off most large-scale crop farmers from hemp. And the reality is it's pretty tough to grow hemp in the U.S. right now. With limited seed stocks, legal roadblocks and nonexistent research. Eric Steenstra, executive director of Vote Hemp, a group that lobbies for hemp legalization, is tempering expectations that hemp will be a savior crop for struggling Great Plains farmers - at least initially. ERIC STEENSTRA: There's no question in my mind that this could be a multibillion-dollar crop where we could see, you know, millions of acres, eventually. Is that going to happen in a year or two? Of course not. RUNYON: But Steenstra says with the plants' inclusion in the latest farm bill, it may not be too long before some of America's amber waves of grain get a little greener. For NPR News, I'm Luke Runyan in Greeley, CO.
GREENE: Luke's story came to us from Harvest Public Media, a public media collaboration focusing on agriculture and food. This is NPR News. Transcript provided by NPR, Copyright NPR. The farm bill passed earlier in 2014 is big news for advocates of hemp. The legislation differentiates industrial hemp from its cousin, marijuana, and paves the way for research across the country on the plant. The U.S. market for foods and beauty products that contain hemp is growing, but American manufacturers that use hemp have their hands tied. The crop is still illegal to cultivate, according to federal laws, which means the current American hemp industry, estimated at $500 million per year, runs on foreign hemp. While the farming community continues to age fewer young people are filling the ranks, prompting the question: Do young people even want to farm anymore?